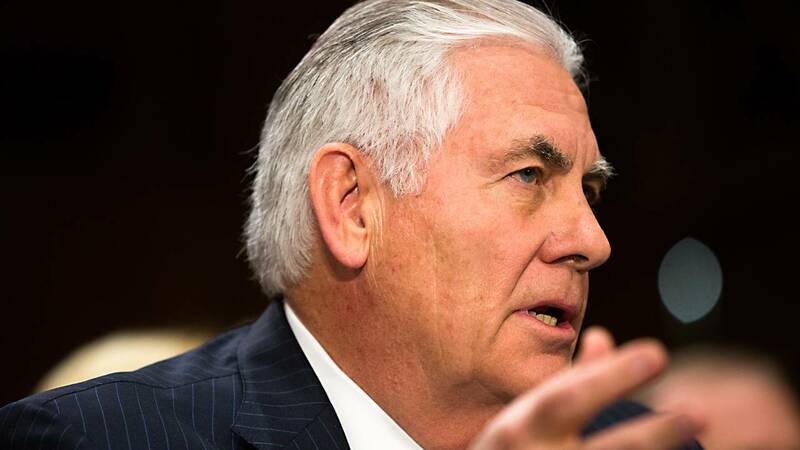 WASHINGTON (CNN) - Secretary of State Rex Tillerson is facing a wave of withering bipartisan criticism that his effort to reform the State Department is instead spurring an exodus of talent that undermines American diplomacy and endangers the nation. The turmoil surrounding Tillerson's stewardship of the State Department deepened this week as lawmakers questioned key elements of his strategy to shrink what he sees as a bloated bureaucracy. Sens. John McCain, the Arizona Republican who chairs the Armed Services committee, and Jeanne Shaheen, a New Hampshire Democrat, said low morale and a perceived flood of career diplomats leaving Foggy Bottom "paint a disturbing picture." In a Wednesday letter to Tillerson, the senators expressed "deep reservations" about his staffing decisions, which, they said, "threaten to undermine the long-term health and effectiveness of American diplomacy." Voicing concerns over a recent halt in hiring new foreign service officers -- a move they say will result in a lack of experienced personnel in the future -- the lawmakers urged Tillerson to lift a hiring freeze and promote experienced Foreign Service officers. Sen. Benjamin Cardin of Maryland, the top Democrat on the Foreign Relations Committee, warned a "high-level decapitation of leadership" has "put our country in danger." "This situation is alarming," he told reporters Wednesday. Even Tillerson's typical allies, such as Senate Foreign Relations Committee Chairman Bob Corker, have tough words for the secretary of state. The Tennessee Republican earlier this week slammed Tillerson's reorganization efforts, saying, "I don't think they are anywhere close to having a plan to present relative to the reforms that they want." By Friday afternoon, State Department spokesperson Heather Nauert acknowledged the trouble, especially when it comes to morale. "Sure, there is a morale issue in this building," she told reporters. "And that's why I say, you know, folks, hang in there. We have a lot of work to be done. Please don't give up. Don't give up on this building. Don't give up on what America is doing. Don't give up on the importance of this job and career." The lawmakers' concern about staffing was prompted by a letter from the president of the American Foreign Service Association (AFSA), a union for US foreign service personnel, excoriating the State Department's leadership. Ambassador Barbara Stephenson told union members the top ranks of the foreign service are leaving "at a dizzying speed." Career ambassadors are the most elite US diplomats in the foreign service, equivalent to a four-star general. Fewer than 60 individuals have attained the rank since it was instituted in 1955. Of the five people who held the rank at the beginning of the administration, three have since retired or quit. Stephenson lamented the department's partial hiring freeze and predicted the loss of top talent will be felt for years. More cuts are in the offing. The Office and Management and Budget has ordered the State Department to slash 8% of its full-time employees, which total about 25,000 people. Because attrition alone will not meet that goal, OMB has directed Tillerson to offer buyouts and early retirement incentives of $25,000 to the first 641 people who sign up by the end of April. Ultimately, aides say Tillerson is focusing on building the State Department for the future, including the next generation of leadership. "Secretary Tillerson is very proud of the work America's diplomats put in every day," said R.C. Hammond, a senior Tillerson aide. "As the employee-led review identifies solutions, we will be coming to Congress with reforms that will create new tools for our diplomats to do their job. We are hopeful every senator will be supportive of these efforts." The White House did not respond to a request for comment for this story. Tillerson was overseas much of this week as the bipartisan criticism of his management stacked up. Following his trip through Asia alongside Trump, Tillerson went to Burma, but is now back in Washington hosting a conference with African ministers. Nancy McEldowney spent 30 years in the foreign service, holding senior positions in Washington, Turkey and Azerbaijan and served as the ambassador to Bulgaria. She left her most recent post in June as director of the Foreign Service Institute over what she called "inept and negative management" by Tillerson and his team. She said several career foreign and civil service officers were unceremoniously removed from their posts in the Trump era. "It's not just demoralizing for the senior officer who is treated this way," she said. "What kind of message is this to the hundreds of people who worked for them and the thousands of people who knew them?" As the new director of the masters program at Georgetown University's Walsh School of Foreign Service, McEldowney said she continues to encourage her students to join the foreign service. But she added: "If this is the reward for loyal service, young people are asking, 'Why should we bother applying to the State Department?'" Adding to the sense of frustration inside the State Department are instances in which returning ambassadors and people who were detailed to other agencies have been assigned low-level jobs in Foggy Bottom, such as answering Freedom of Information Act requests. "I used to advise the President on national security and now I'm reviewing FOIA letters," one mid-level career officer who was detailed to another agency under Obama said. "I don't know how much longer I can do this." Several other senior officers say they have been given signals they should move on from the State Department because there is no way to get ahead. Tillerson has downplayed reports of low morale, telling Bloomberg Businessweek in a recent interview, "I'm not seeing it." Calling the State Department reform effort "employee-led," Tillerson has held several meetings with young diplomats to garner their ideas and has been spotted in the State Department cafeteria holding brown bag lunches with mid-level officers. But several senior career officers have said those sessions amount to a "fig leaf" where Tillerson appears to take the opinions of foreign service officers into account. "People are in a room talking, but are they people with breadth and depth of experience?" one senior career official asked. "Not necessarily." The officer said Tillerson, who moved up the ranks of Exxon-Mobil to ultimately lead the company, "has no use for anyone with experience." Several senior career officers are serving in top positions in an acting capacity until political appointees are confirmed and have been given high profile assignments. They include Susan Thornton, the acting assistant secretary for East Asian affairs, who recently traveled to Asia with Trump and has emerged as Tillerson's top adviser on Asia. Tim Lenderking, a senior diplomat in the department's Mideast bureau, has also taken the lead on the dispute between Qatar and its Gulf neighbors including Saudi Arabia and the United Arab Emirates. "If you tie the hot spots of the world Secretary Tillerson is focusing on, you can name a career official who is sitting outside his office waiting to talk to him every day," Hammond said. Tillerson has praised the Foreign Service officers who have stepped up, challenging the notion their expertise was being ignored. "These people are engaged with our counterparts in leading this diplomatic effort," he told the Senate Foreign Relations Committee last month. "I'm proud of them. They are doing a great job." Foreign service officers serve across Republican and Democratic administrations, but there is widespread dissatisfaction among this group with the direction of Trump's foreign policy. Even before he took office, more than 1,000 diplomats signed a "dissent" cable voicing concern about what they viewed as dangerous rhetoric contrary to American values. "The State Department has a history of frank discussion before policy decisions are made," McEldowney said. "But we were told early on there is a 'trust deficit' and if you want to rebuild that trust, get in line and follow the policy.' But internal debate does not equal disloyalty or disobedience. Quite the contrary." Said one career officer of the foreign service: "We have always been a grumpy group." The diplomat went on: "This is not just about how the place is managed. It is about the politics, policy and a whole approach to diplomacy. We are a country in the midst of serious political change that will have a profound impact on how we do our foreign policy and people are having to come to terms with that." For young officers willing to cool their heels and wait out the chaos, the departures of the senior diplomats could present an opportunity to move up the ranks more quickly than expected. But for many senior and mid-level officers who likely would have stayed longer under another president, the winds of change present an opportunity to serve their country in different way. Several diplomats who recently retired are preparing bids for Congress in 2018 and beyond. "I leave with immense pride with what I did here," said one senior officer who joined the Foreign Service with George W. Bush and is retiring next month. "I have a considerable amount of intelligence. I have an MBA. I can make as much money as I choose or I can find other ways to be of service. I think Rex Tillerson needs us more than we need him."